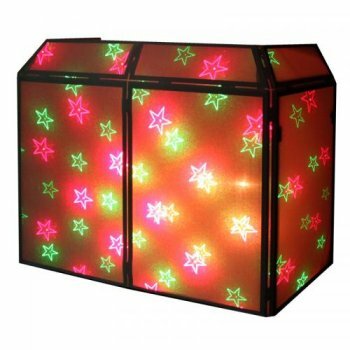 The starcloth is supplied complete with a easy to use controller featuring auto, twinkle, full on and sound active. Approx 6ft wide x 4ft high x 2ft deep. Metal steel tubing with heavy duty shelf. Grab and hold the limelight with this stunning corporate lectern – perfect for delivering speeches and presentations in schools, colleges and businesses. That all-important great first impression is guaranteed with this lectern’s white frosted front panel and attractive acrylic design. The modesty panel can take corporate branding to create that extra punch and air of authority for your presentation. Make sure you capture the attention of your audience and have them riveted to your delivery throughout with this eye-catching contemporary lectern. 1000mm wide clear acrylic top. 500mm (w) x 380mm (d) base. Shelf for laptop and goose neck microphone to sit. Flat packed for easy assemble. if you are looking for an attractive lectern that won’t break the bank, our Budget lectern is the ideal solution. sustainable MDF which you can paint or stain yourself to your chosen finish, the Budget lectern provides a good value solution without compromising on appearance. The simple, classic design will fit in well in your church, school or conference facility, while the cost is probably the lowest available on the internet. 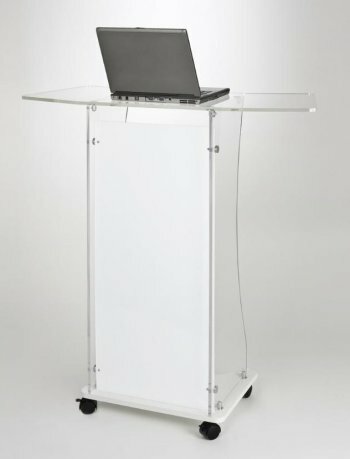 Ultimax TrussLite Lectern. 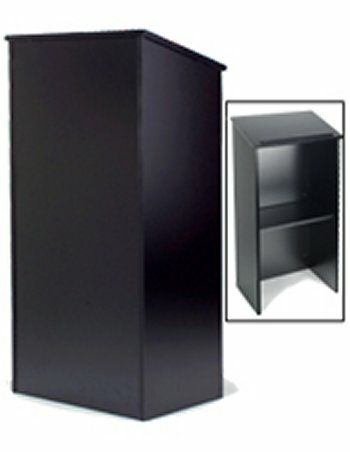 Professional use lectern finished in Black. 3/8″ and 5/8″ mic adaptors are supplied which can be fitted to the left, right or centre to attach a mic clip, boom or gooseneck. Cables can be run through the centre of the stand and the top plate has cable management cut outs included. Very Strong Steel construction. 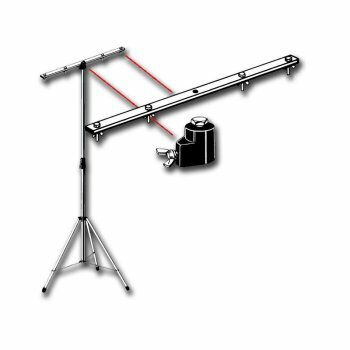 The Telescopic Lighting Stand by is an ideal lightweight accessory for any portable DJ and lighting rig. Featuring space for Lasers and Other Lighting ,T-bar will take up to 40gs in weight. 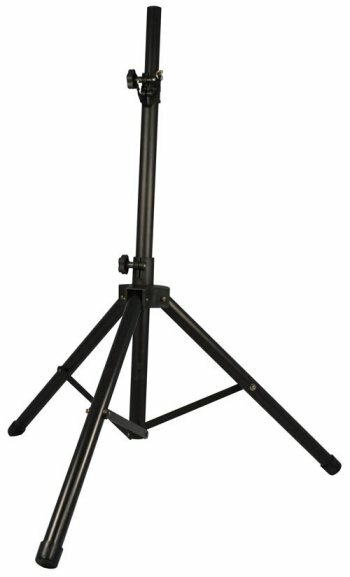 The Steel tripod base is lightweight but very sturdy.The tripod base lighting stand has been made from heavy duty Steel to make the stand secure as well as lightweight. 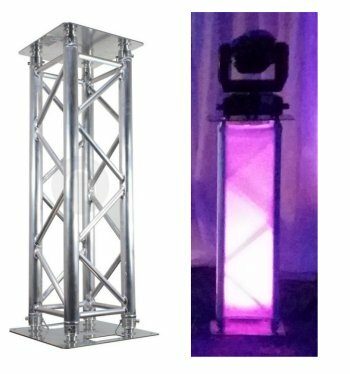 The Telescopic Lighting Stand is an ideal lightweight accessory for any portable DJ and lighting rig. Featuring space for four par cans,Lasers and Other Lighting, this 95cm long T-bar will take up to 20kg in weight. 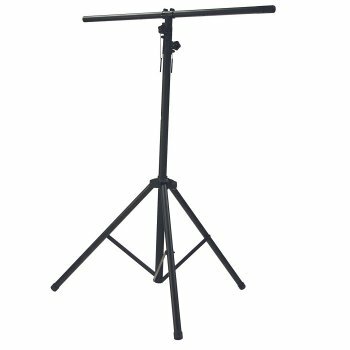 The Steel tripod base is lightweight but very sturdy, and the pole is height extendable between 110 and 250cm tall. This is a full function stand finished in matt black. The boom arm can be removed or set at any length or angle. Height is adjustable between 94cm and 1.75 metres. The boom arm is 50cm long extending to 90cm. 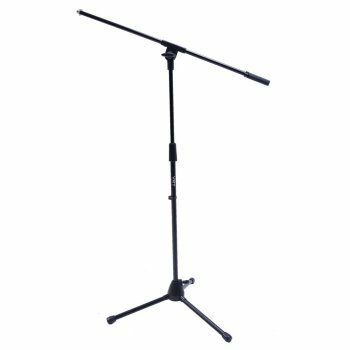 The folding legs are 33cm long to provide good stability should a heavy microphone be used with the boom arm fully extended. The end of the boom arm is threaded 5/8″ and is supplied with a 5/8″ to 3/8″ thread adaptor and a mic clip. The thread between the stand upright and boom arm is 3/8″. For durability, the base unit and telescopic height adjusting sleeve are metal, not plastic. The Global Truss F33 feature TUV Certified aluminium welding and 3mm wall thickness for a superb load handling capacity. Conical connectors with pins and R clips are provided with each piece for quick assembly. 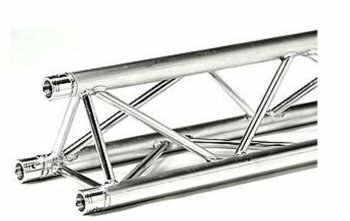 3 metre sections of tri truss are available for all your staging needs! Ladder truss also available, please ask for details. This is Great for Hanging up Lighting and also Projection Screens. Also it comes with a LED Star Cloth to Trap on to which gives out a Great Effect. 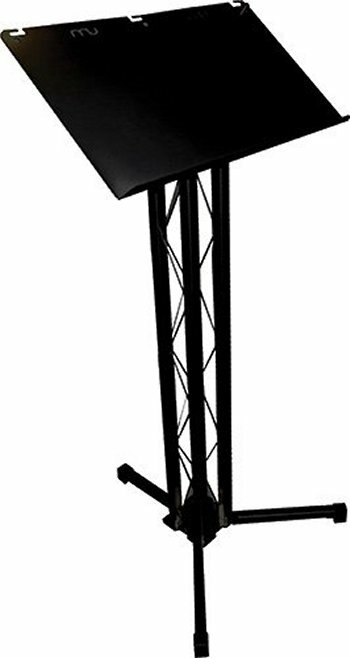 The K&M 21450 Speaker Stand is an ideal solution for gigging DJs an musicians. The aluminium frame is lightweight and strong for easy portability. The 2 piece design allows you to fold the stand into a compact shape. This model has a maximum reach of 193cm and a load capacity of 50KG which is ideal for large speakers. The 21450’s tripod base is sturdy on the stage and keeps the frame upright on uneven surfaces. This model has a black colour for a classic look. Revostage is based on two main elements – a patented telescopic riser support and a structural stage platform. The two elements incorporate a unique fixing system to enable the stage to be erected with the use of a simple allen key. Revostage is a portable stage system. It is lightweight, extremely strong and very quick and easy to setup. The stage platforms are only 30mm thick so compact to store and transport, yet the system is strong enough to support 2 tons per square meter. The decks attach securely to the folding riser by a simple quarter turn of an allen key. Adjacent stage desks are locked securely together using the same allen key. Our staging comes complete with a black wool serge valance or skirt that clips onto the edge of the stage desks. 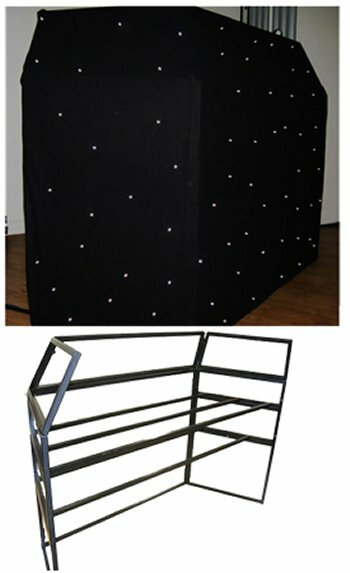 Quickly build stages, platforms, rostra or podiums with this easy to use portable stage system. Steeldeck uses steel or aluminum scaffolding tube for legs. Complex structures can be designed by bracing the legs with standard scaffolding components. A Steeldeck® platform has no moving parts, so maintenance is kept to a minimum. The tough steel frame is extremely durable and the plywood top can easily be replaced. Stage skirt in black also available. 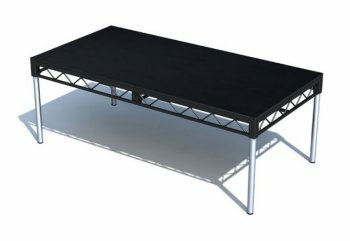 Steel Deck Stage can be 1ft, 2ft or 3ft high and as big as you require. This sturdy stage is ideal for outdoor use. Truss Plinth 1.5M ia a Quad trussing plinth package for mounting moving heads and other similar lights. White cloth surround gives a great effect. Uplighter LED light at the base gives off a colourful effect. Please ask for details. Wooden Dance floor – Wood Parquet. Plain wooden dance floor is the most practical and economical. Either DIY (dry hire) or we can lay. Easy to assemble with a diagram which is provided. Just push and click together. 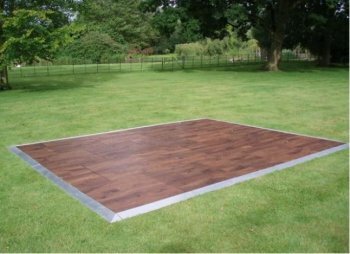 Our quality wooden dance floor uses a special locking system and will not come apart whilst being used. The surface is covered with several coats of varnish which is polished to give a shiny yet non slip finish. A perfect addition to Marquees and Garden Parties, Aluminium trims around the edges and corners finish the dance-floor off. Our wooden parquet dance floors are supplied at events, most commonly sized at 12ft x 12ft (3.6m x 3.6m) for up to 80 guests.